Stephen Colbert got an unexpected treat last night, when Pearl Jam appeared on the show to perform together live for the first time this year. The band was there to promote its upcoming headliner appearance at the Global Citizen Festival in New York this weekend. After a brief chat, the band took to the stage and played “Mind Your Manners,” off the group’s recent Lightning Bolt album. 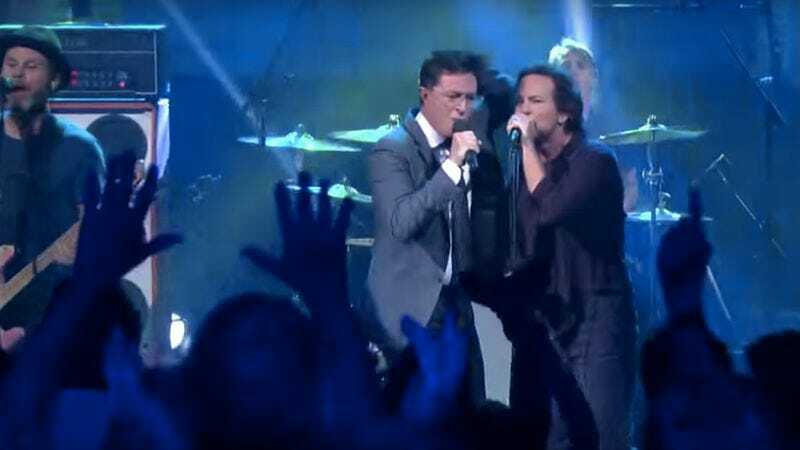 However, to play out the episode, chants of “One more song!” by the crowd led the band to launch into a version of Neil Young’s “Rockin’ In The Free World,” clearly delighting Colbert, especially as he got the chance to sing along with Vedder on the refrains. While the late night host is a strong singer, as anyone who’s seen his live musical theater chops can attest, his smooth and mannered voice isn’t exactly a perfect fit for the rough cadences of the rock classic. Still, he obviously had a ball: “You don’t get to do that every day!,” he exults repeatedly at the end of the set. Well, not unless you’re, say, Pearl Jam. Watch both videos below.